Wow what an amazing event for MM, so many highlights! 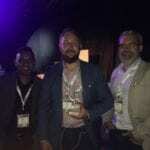 Lets start with the end and inform those who have not been following us on Twitter (@Modernising) that MM won a Qlik Customer Innovation Award for the innovative work we did together with our Standard Bank team on their Social Media Sentiment Analysis application. I would like to add it is an absolute pleasure to work with a highly effective Qlik Team and this was genuinely a collaborative effort from both customer and MM. 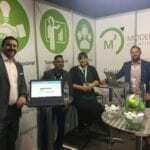 The Standard Bank Of South Africa IT and Marketing teams utilize QlikView and Qlik Web connectors to retrieve and analyze keywords, customers and employees social media engagements including sentiment analysis on various bank products and services. The bank benchmarks themselves against other banks through connecting to Twitter, Facebook, Klout and a sentiment engine to track feeds from people, followers, #hashtags, mentions, favourited and more. The true value of the solution is not only in the Qlik automated solution, but in the analysis and improvements the bank makes through better social engagement with their employees and customers. Awards bode well as reward and target! I congratulate the MM team, who are not only highly effective, but living on the innovation cusp of all that Qlik technology affords us! We had so many of our existing customers, especially our banking customers joining us at the event and allowing us to show them some of the other innovative things we do with Qlik. Thank you for taking the time, the great discussions and the follow ups! We also have the opportunity to promote some of our partner’s technology (NarrativeScience, ebiexperts, and Squirro) and we thank them all for supporting us before and during the event. There was some really good interest in all the technology and we look forward to the follow-ups. The age of data sciences and advanced analytics combined with contextual intelligence is going to be super exiting for us as a company! Well it was a long very exiting day and we congratulate all that participated. Congratulations to @Qlik, @Modernising, @SA_Qlik for work well done!